Mr. Sandman is yet another CD maxi single that was pretty big on the import scene when it arrived, which I also regretfully purchased sight unseen in hopes there would be some new material of note. Unfortunately, most of this release is now redundant if you own other, better, compressed collections of the band's rarities, and it is very hard to recommend unless you are of course someone who cannot live without owning every piece of product ever issued from the artist (in which case, good luck). "Mr. Sandman" itself is a cover of The Chordettes classic penned by Pat Ballard in the 50s, and though Blind Guardian don't make a mess of it, it's the type of novelty you might listen to once or twice while you slurp your ice cream cone and then never really care about again. There is an 'edit' of "Bright Eyes" here which is completely worthless unless you run a college radio station and need to save a minute of airtime. Strangely enough, this single was released under the Bright Eyes title in Japan with a different tracklist. "Hallelujah" was at one point unique to this release, and probably the best thing here, a more rock & roll take on the typical Blind Guardian track. The remainder of the single consists of demo version of "Imaginations from the Other Side" and "The Script for My Requiem", neither of which impresses me more than the final version of the Imaginations album. It's not as if anyone was ever held at gunpoint to buy this single in the first place; but considering that the two unique tracks "Mr. Sandman" and "Hallelujah" could be found later on The Forgotten Tales compilation (the latter only on the 2007 remaster/re-issue) alongside other oddities and covers, I find it hard to recommend to anyone without money to burn. And if you do have money to burn, I'm taking donations! 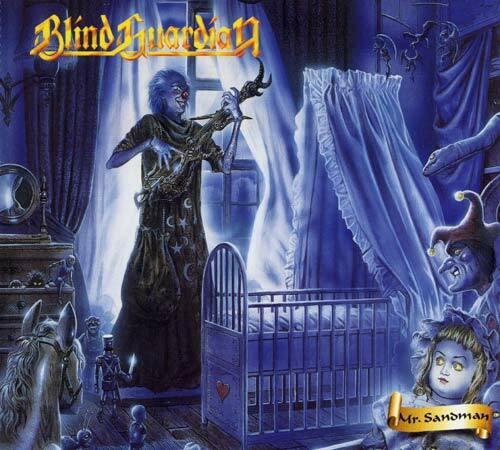 Of all of Blind Guardian’s various single concoctions, “Bright Eyes” is probably the most musically schizophrenic yet still within the realm of metal release. Part of it reflects a turn away from the older speed metal style that was still in full swing on “Somewhere Far Beyond” towards something that didn’t need to be consistently fast. The title track has some similarities to the more 80s influenced mid tempo song “Theater of Pain”, but seems to rely more on that cheesy Dokken brand of spooky riffing in the vain of “Dream Warriors” than the epic sound that was standard on every song before this. It is a good song, but it is plainly noticeable why some of Blind Guardian’s older fans didn’t take to it or much else of what was on the album it came from. The rendition of the old doo-wop classic “Mr. Sandman” goes back and forth between being comical and kind of creepy, depending on which half of the song your listening to. Hansi Kursch has an unusual gift for making his voice sound like a 50s singer, yet suddenly morph into a shouting psycho when he wants to, and the way the heavy section goes definitely falls into something that sounds outside the realm of sanity. The band sort of go through the motions with the remake of “Hallelujah”, which was one of my least favorite Deep Purple songs, and simply add distortion and a few faster sections. The demos are a little more interesting, showcasing a band that can sound good even with a recording sound that is pretty thin. Just picture Blind Guardian doing a live version of “A Past and Future Secret” in your living room and you’ll have an idea of the bareness of the production. This is a good single, but not something that could be called essential listening. If you happen upon it in a store at a price of $4, you might want to hear it if you’re a fan of the original version of the Deep Purple song and if you want to be freaked out by a pretty kooky metal rendition of a 1950s pop song. There was an alternative version of this single that features “Mr. Sandman” instead of “Bright Eyes” that is basically the same listen minus one song. So whichever single that you come across, the recommendation is the same.